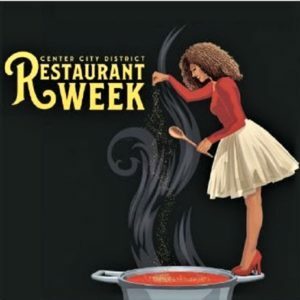 Philadelphia’s Center City District Restaurant Week rolls around twice each year; and it is always worth checking out. Why…? Because it affords you the incredible opportunity of dining at some of Philly’s finest eateries at bargain basement prices – a mere $20.00 for a three-course lunch; $35.00 for a three-course dinner. Beverages, tax & gratuity, of course, are extra… as are certain additions to the three-course bill-of-fare. And bear in mind that not all Restaurant Week menus are created equal; so, you might have to do a bit of research to come up with those that offer up the best quality bang for your hard-earned buck. But, trust me, it’s worth the effort. For our most recent culinary excursion, my dining partner and I decided to pay a call at High Street on Market. Once little more than a take-out addendum to Fork, co-owner Ellen Yin and Chef Eli Kulp (who, even after the ill-fated 2015 Amtrak crash, still remains a vital part of Ms. Yin’s ever-expanding restaurant organization) have refashioned the diminutive bustling space into an exceedingly popular breakfast-through-dinner restaurant with its own unique identity. 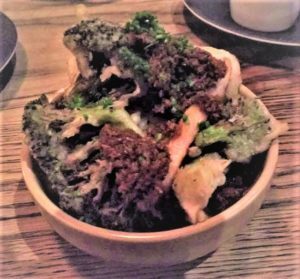 Significantly less expensive and more laid back than its next-door elder sibling, High Street still maintains the very same commitment to the utilization of farm-to-table quality ingredients and their careful and thought-provoking preparation & presentation. 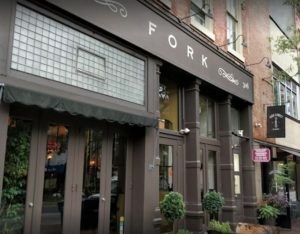 Mr. Kulp is fond of pointing out that Fork is one step to the left of the culinary mainstream… while High Street is a step or two to the left of that. Perhaps… but High Street’s creations are not nearly as abstruse on the palate as they appear to be on the menu. And while a few of the daily specials may prompt unsuspecting patrons to go running for the newest edition of the Food Lover’s Companion, the majority of printed items – especially those offered up during Restaurant Week – require little or no decrypting skills. The first course consisted of Fried Brussels Sprouts and my companion’s Crispy Mixed Vegetables. Interestingly enough, Brussels sprouts – the vegetable children (and adults) love to hate – has been discovered (or rediscovered) with impunity by American chefs of late and observed, at least by this writer, as popping up on restaurant menus with extraordinary regularity. What set this presentation apart, however, was not only the fact that the sprouts were chopped into bite-size pieces (rather than whole or halved), but also that they were perfectly prepared. Most Brussels sprouts arrive at table woefully over or undercooked. These were just right… and the seasoning – splash of lemon and a tantalizing anchovy parsley vinaigrette – utterly addictive. The Crispy Mixed Vegetables (pictured) were equally sublime in their apparent simplicity. Caressed by a thin coating of rice flour and then flash fried, the result was a lighter-than-air crackle followed by an assortment of firm-to-the-bite veggies invigorated with a generous slathering of “chow chow,” a spicy pickle relish that succeeded in adding a healthy dose of heat to the proceedings. Other appetizer options included Mussels in a pilsner & charred onion broth with pickles and grilled bread; Wedge Salad with crispy pastrami, rye croutons, blue cheese, and Russian dressing; and Angry Crab Ragoon with pickled chilis, scallions, and fromage blanc. 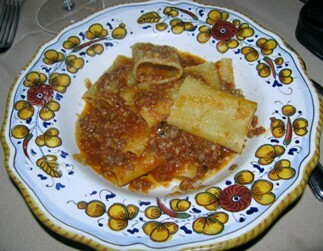 As we moved on to the main dishes, my dining partner’s Malfatti, loosely translated “badly made” – as these spinach & ricotta dumplings tend to resemble rather sloppily put together ravioli – were in reality, anything but. Their texture was ethereal, the parmesan seasoning incomparably delicious, and the roasted wild mushrooms perfect traveling companions. 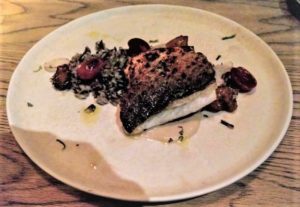 My Grilled Branzino was beautifully presented, skin-side up, surrounded by roasted grapes, sunchokes, and almonds on a seabed of wild rice. I have always been of the opinion that finny fare is best served by those accoutrements that intrude the least… and High Street’s presentation is the perfect example of that culinary philosophy at work. There’s just enough going on here to complement rather than conflict with the branzino’s natural attributes. Sometimes, less is, indeed, more. Additional entrée options: Pappardelle with spicy smoked lamb ragù and pickled chilis; Steak & Potato: hanger steak with crispy broccolini, tater tots & buttermilk; and Half Brick Chicken with grilled gem lettuce and Caesar dressing. 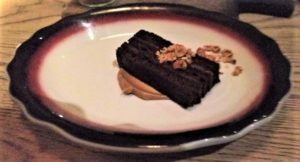 Dessert choices, which were minimal – a so-so Butterscotch Pudding and an excellent Chocolate Hazelnut Cake – proved to be the weakest link in High Street’s Restaurant Week dinner menu chain. The house-made bread, on the other hand, for which the restaurant is justly famous, is something of a must, and certainly worth the modest supplemental expenditure. In addition to the tempting culinary offerings, the restaurant has also put together an exciting array of unusual cocktails and spirits, as well as a compact but extremely interesting wine list. 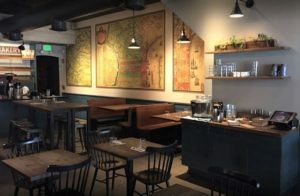 Whether stopping by for Restaurant Week, or for business and/or pleasure, High Street on Market offers diners a unique and fascinating dining experience.